Japanese 3rd Birthday players that thought they were watching Aya Brea take a shower over and over in private, were wrong. 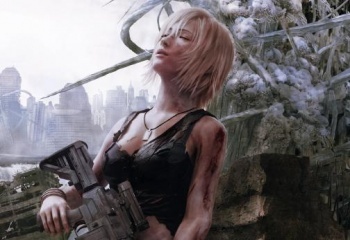 Square Enix's unofficial Parasite Eve sequel The 3rd Birthday has only been out in Japan for a month, but players have already racked up 80,000 views of the game's shower scene. How does Square Enix know this? It's watching you. Any 3rd Birthday player that links a Square Enix Members account to the game will have their statistics sent to Square. It's all typical stuff, like how many shots you've fired, your level of progress through the game, and... how much of a virtual perv you are. Square Enix decided to embarrass the game's Japanese fans by revealing the hours they've spent watching main character Aya Brea in the shower. Square Enix actually made the shower scene a form of reward in the game, as it becomes available when completing certain conditions. Only the best 3rd Birthday players will be able to unlock an unlimited number of views. The scene was responsible for 3rd Birthday's elevated "CERO D" rating in Japan, which is equivalent to the ESRB's Mature rating. The 3rd Birthday is expected to be released in North America sometime in March, and I think you all know exactly what not to do if you want your privacy protected. Not that there's anything wrong with watching an imaginary girl shower 80,000 times, but it's a little embarrassing to admit.